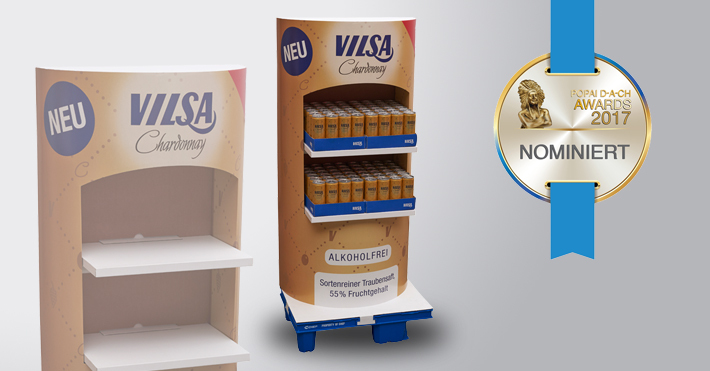 This year Gissler & Pass was nominated for the POPAI Award for the third time, having convinced the jury with a can display for Vilsa Brunnen – Otto Rodekohr GmbH & Co. KG. The high-profile ¼-chep display designed to support the product rollout of ‘Vilsa Chardonnay non-alcoholic’ picks up on the shape of the new Vilsa can to deliver an original and appealing brand presentation for the food and beverage retail sector. The product-specific POS design is bound to boost brand recognition and pique people’s curiosity. On top of that, thanks to the display’s excellent stability the two product tiers can protrude far beyond the display body despite the high load (48 cans per tier) to present the new Vilsa product in the proper light. This makes it clear that the beverage can is the star here and the centre of attention. It’s also possible to position the display back to back to have a full-blown can that permits access from both sides. At the awards ceremony scheduled for July 2017, Gissler & Pass will know whether the display solution is going to fetch gold, silver or bronze. The association POPAI (Point of Purchase International) is a global player seeing itself as a centre of excellence and communication platform for all things marketing at the POS. Year by year, POPAI honours successful POS solutions at an international level. At a special show encompassed in the EuroShop 2017, Düsseldorf (the leading trade show for the retail technology segment), all of the 63 submitted pieces were exhibited from 5 to 9 March and rated by a panel of independent experts as to innovativeness, aesthetics, compliance and impact on buying behaviour.